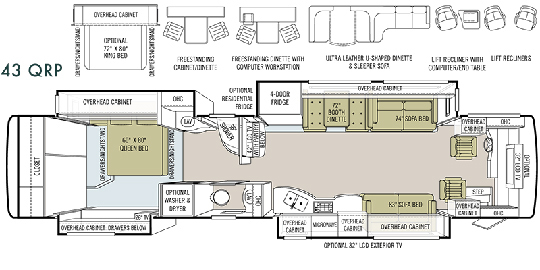 Last year Tiffin Motorhomes unveiled a new floorplan - the 43QRP. 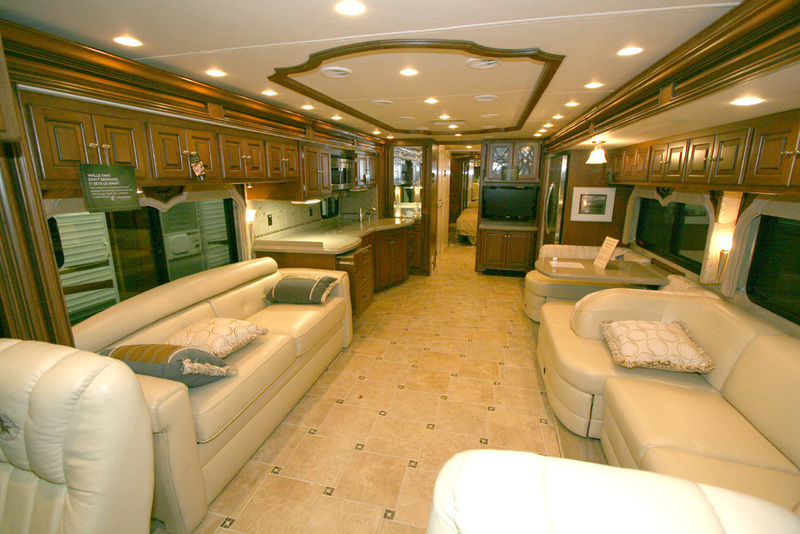 This floorplan belong to the Allegro Bus product line. It breaks from the popular 42QRP, first introduced in 2007 by relocating a few key components into the slideouts to further improve useable floor space. The 43QRP takes the refrigerator from the fixed center mast section of the coach and places it in the main driver's side slideout. 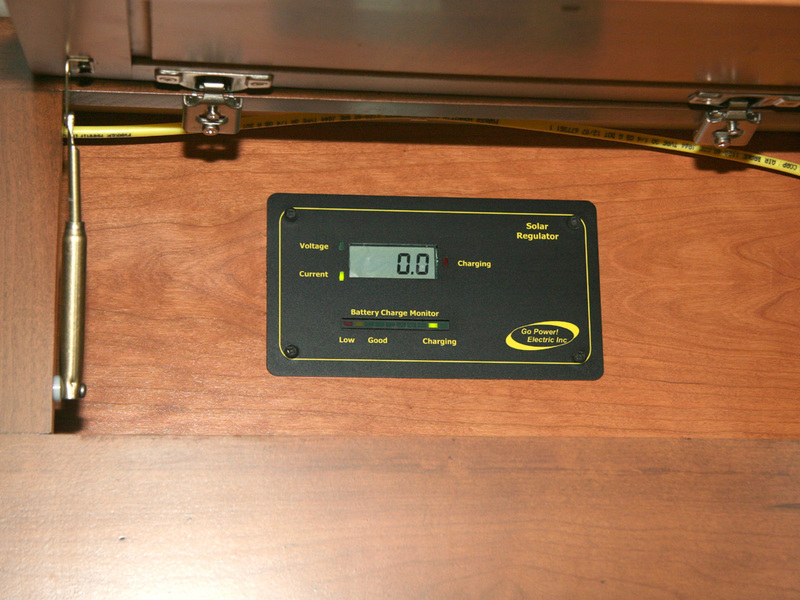 When the slideout is extended this greatly increases the ease of access to this refrigerator. 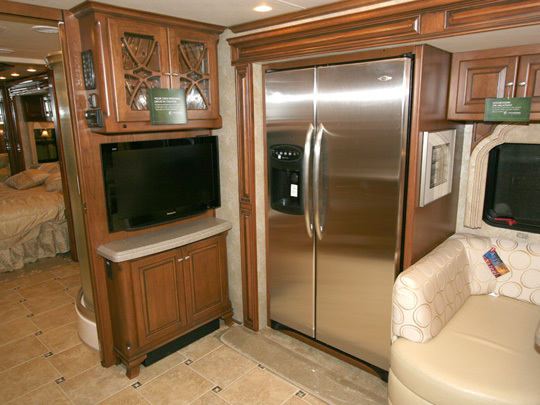 The wall now exposed by the refrigerator relocation now features a hutch that can hold a mid-ship LCD TV. 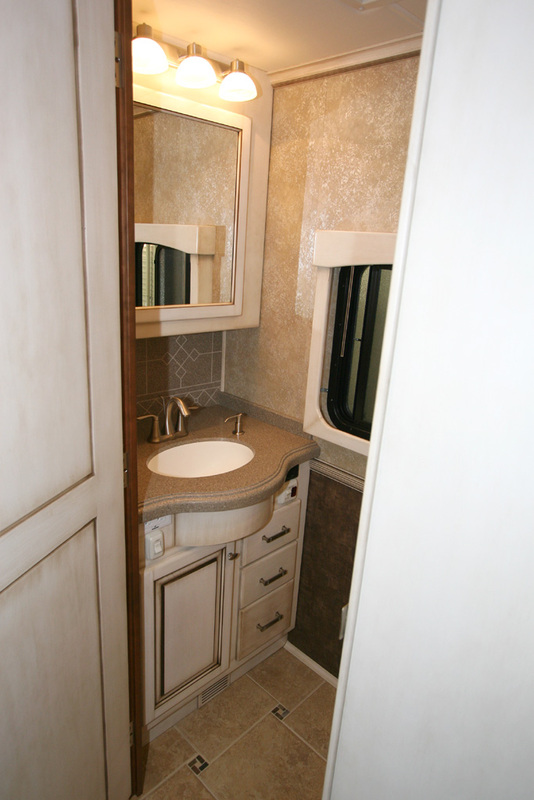 In addition the bath area lavatory was also moved from the fixed center section to the driver's side bedroom slideout. The slideout was lengthened to include this portion of the bath area in it and the floor space in this area is also greatly increased due to this change. The addition of an extra foot to the floorplan allowed these changes to take place with very little taken away from the floorplan features of 42QRP. The most notable exception is the loss of the 42QRP's slide-out pantry. I was recently able to photograph the 43QRP while visiting	King's Campers in Wausau, WI. It was inside their showroom so I didn't get any exterior pictures but by now most of you know what a 2009 Allegro Bus exterior looks like. If not, there are plenty of other reviews on this site that can better illustrate the exterior shots. I did take a few interior shots though and these are included below to share with my fellow members of the TiffinRVNetwork forum. Accordingly, I won't detail every little feature on this coach because that's been handled in the other reviews but I will attempt to show all of the features new and unique to the 43QRP. 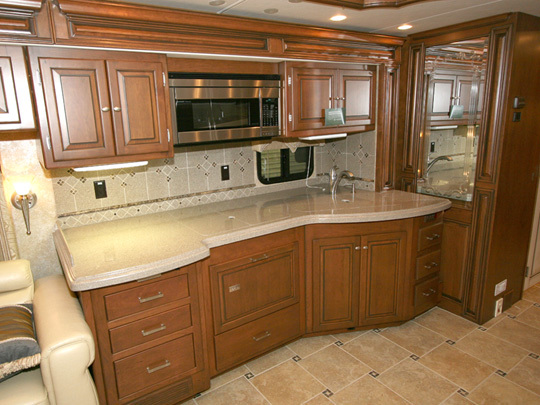 Current pricing on all new Tiffin products can be viewed on my Tiffin Motorhomes Pricing page. Note that I have also uploaded larger 1024x768 (XGA) images in addition to the smaller ones shown in this review. If you want to view a larger picture simply click on the image in the review and a new window with a full screen image will appear. If you would like to print this review it probably won't work that well. The pictures and text on the far right will probably get clipped. If you want to print this review, Click Here for a Print Ready Version. Feel free to download or save any of this text or images if you want. If you repost any or part of it to any other website just be sure you don't change any of my wording and please mention where it came from. The above images show the changes made this year to the overall interior. The ceiling is now fitted with a wooden decorative frame while the recessed halogen ceiling lights have been retained from previous years. This particular coach had the optional glazed cherry cabinets. The 43QRP comes standard with a mid-ship mounted TV. However, an optional LCD TV can also be placed in the overhead cabinetry above the dash area. 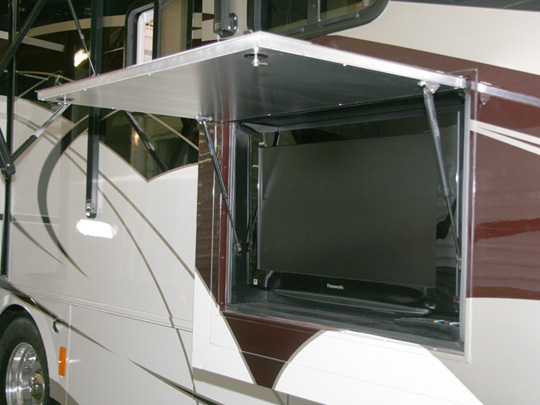 This can be useful if you want to view TV while parked in a rest area or any other area where the slideouts cannot be extended because the main slideout will block the mid-coach TV from being seen unless it's extended. The cabinet directly over the driver's seat contains various control panels to operate the many house systems. 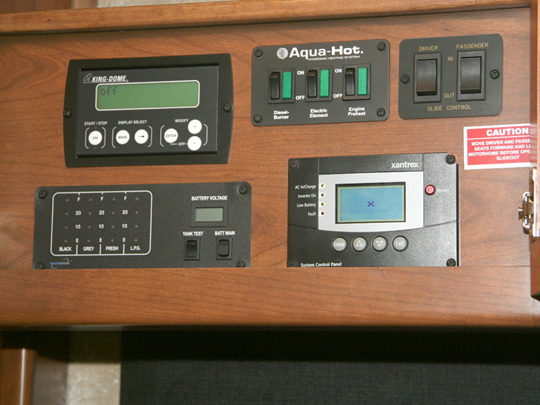 A tank monitor panel, slideout control panel, inverter and automatic generator start panel, King-Dome satellite TV control panel, and Aqua Hot heating system control panel are located here. 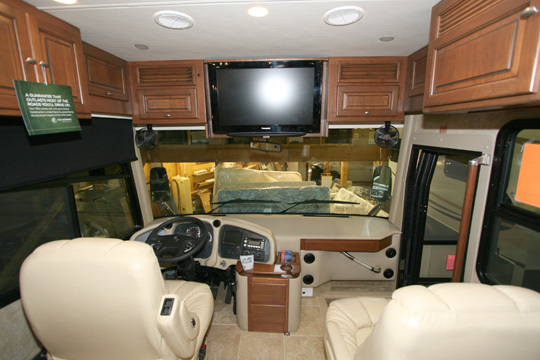 Over the passenger's seat is a cabinet that houses the Surround Sound System and DVD player. It also has room for a satellite receiver or other device. 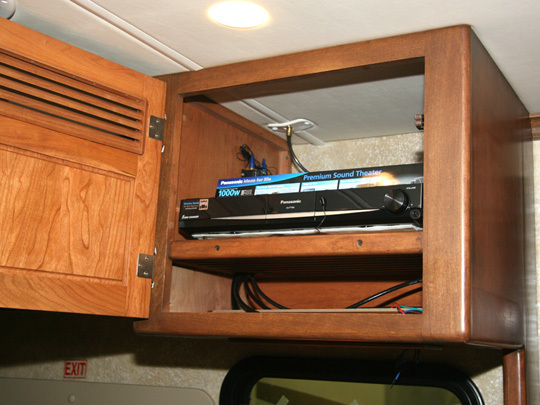 This year the cabinet has been remodeled to increase the depth to allow larger, deeper DVRs to be located in the top portion. In one of the overhead cabinets in the front cap is a charge controller for the optional 125 watt solar panel. Okay, I lied. I guess I will include one exterior picture. On the patio side of the coach the optional exterior entertainment system is found. This consists of an LCD TV with a weatherproof hatch cover that swings up and acts as a sun shade. This TV is located in the passenger side slideout and it's raised height makes it much easier to view than typical basement TV locations. 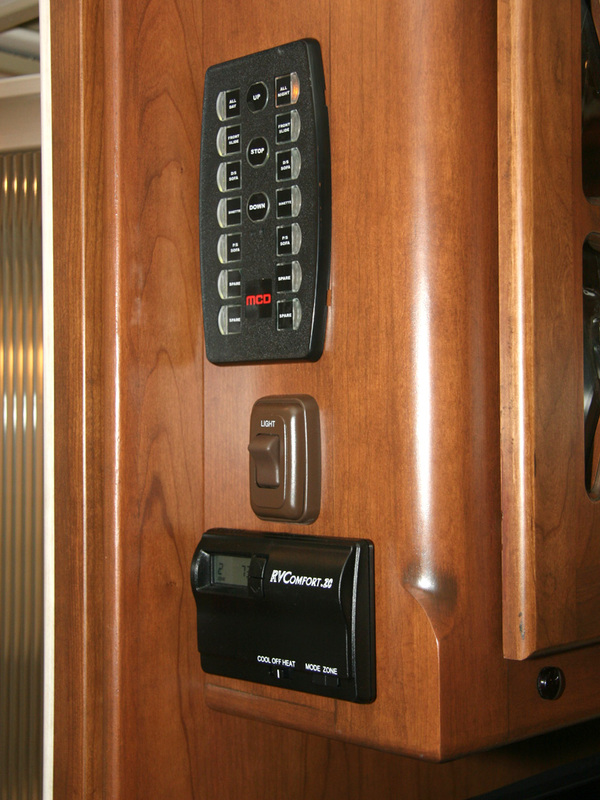 The 43QRP features solid hardwood cabinets, which in this case were cherry with a glazed finish. A stainless steel trimmed convection/microwave oven is standard and there is a substantial amount of countertop work space. Both the 2 burner cooktop and galley sink are covered with removable panels to offer additional work area. This similar view shows the galley workstation extended. 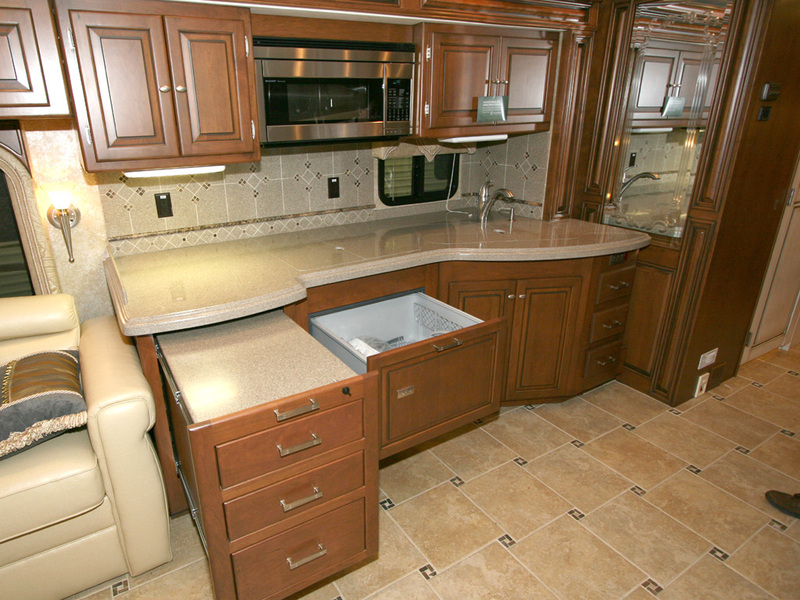 This slide-out workstation features full depth drawers and is trimmed in solid surface material, as is the rest of the coach's countertops. The optional dishwasher is also shown in the extended position. 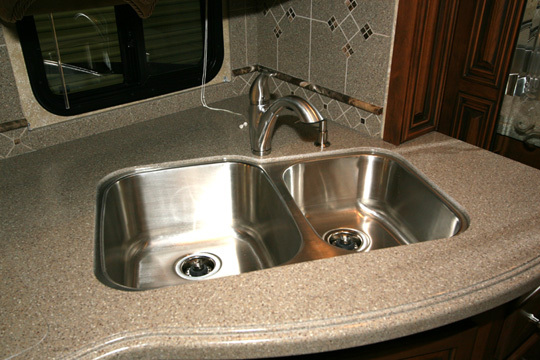 The galley sink is an under-counter mounted stainless steel sink. This year the sink has deeper tubes and increased size. A Moen brushed stainless mono-faucet with integral sprayer is used as well as in-counter soap dispensers. 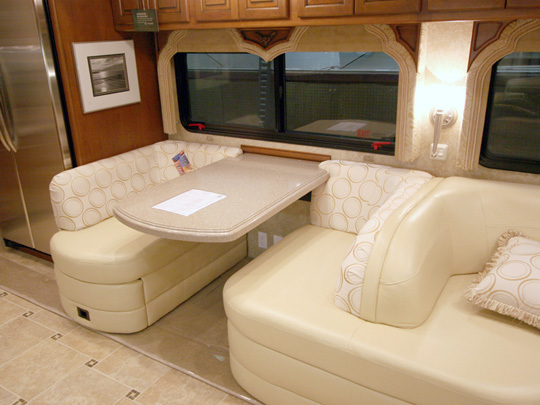 The 43QRP is available with a free standing legless table, a computer desk/dinette, or this new-for-2009 U-shaped dinette ensemble which further wraps around into the salon couch. The black latch visible in this image opens up a large storage drawer. This dinette style does lose the solid surfaced buffet that is found in both the free standing dinette and the computer desk versions. The 43QRP is available with either Norcold 12 cu ft RV refrigerator or the 22 cu ft Whirlpool residential refrigerator with in-door ice maker and water dispenser. The residential fridge is the most popular option. Here too we can see the 32" LCD TV in the glazed hutch. For 2009 the Allegro Bus gets a new ceramic tile design, utilizing small accent tiles to complement the larger tiles. This Bus came with the optional power shades in the main living area as well as the cockpit. These are MCD dual roller shades with both sun control and privacy shades. The power control system for them is located in the walk of the hutch facing the hallway where it can easily be accessed. 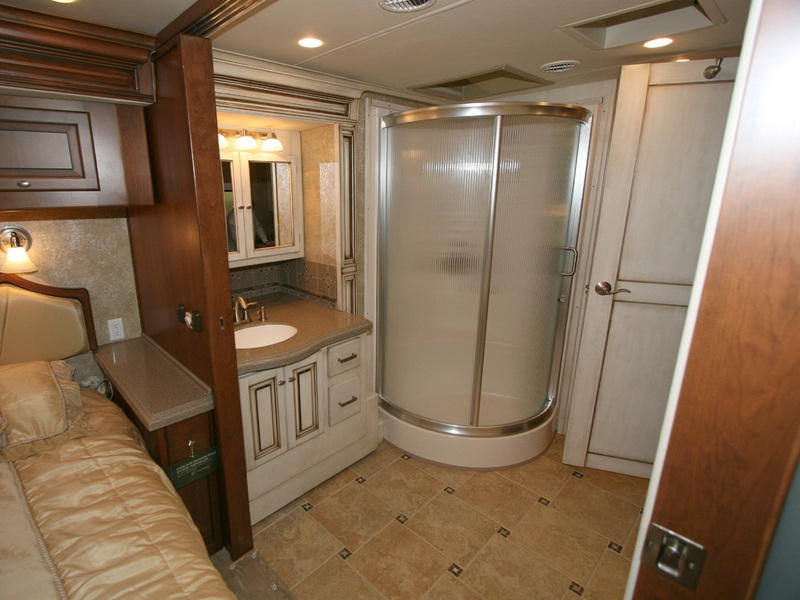 This coach came with optional white chocolate glazed paneling in the center bath area. The idea is to help separate the bath area from the front of the coach. Some people like it, some don't. But, it is optional so you don't have to take it. Another popular option is the stackable washer-drier. This area can be figured with the stackables, a Splendide combo washer-drier with overhead shelving, or as a huge storage closet. The main bath area is finished in the same white chocolate trim as the hallway. 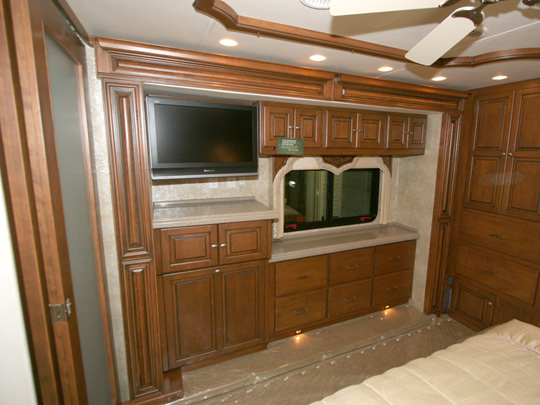 If you do not order his optional trim, everything is cherry like the rest of the coach. The circular shower has a sliding door to prevent any water runoff from dripping on the floor when the door is opened. A solid surface vanity holds a flush mount sink and Moen faucet and fittings. 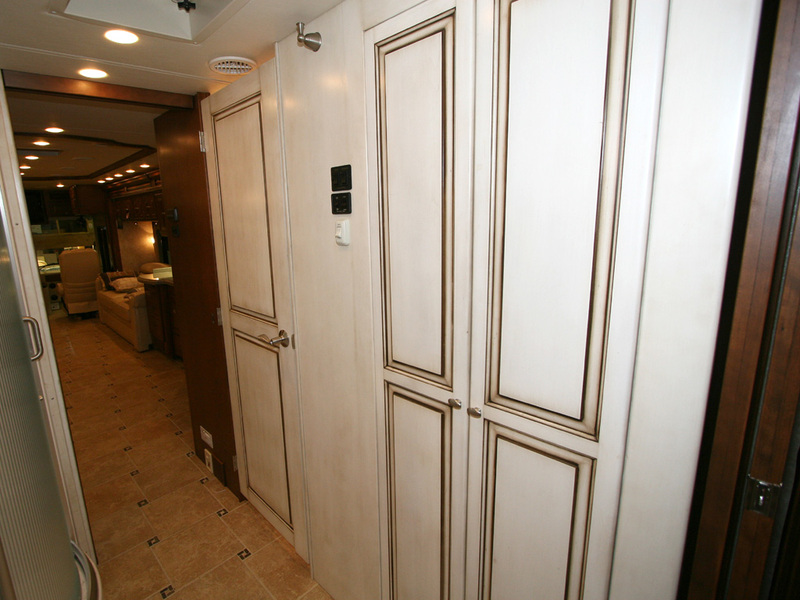 The toilet room also features a similar vanity and medicine cabinet. 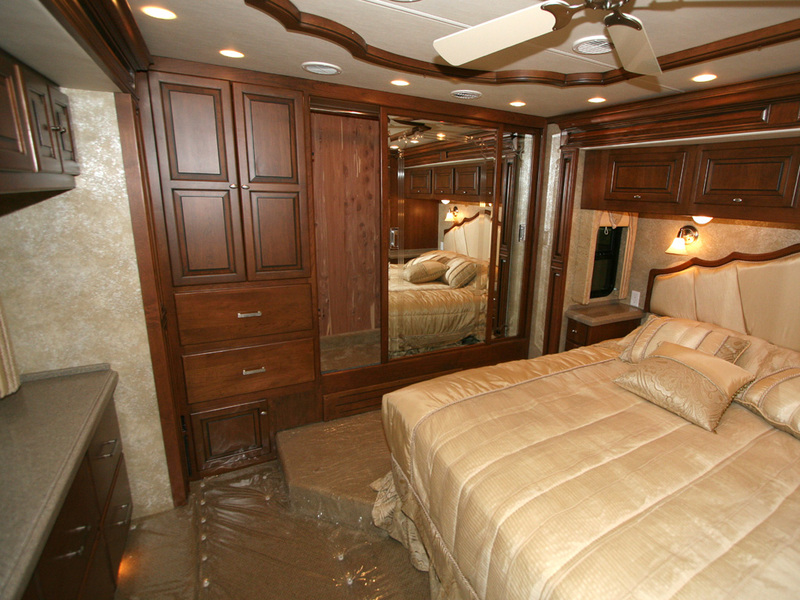 The master bedroom features either a king or queen bed with plenty of storage space underneath. The queen bed will have wider end tables than the king bed, which is shown. 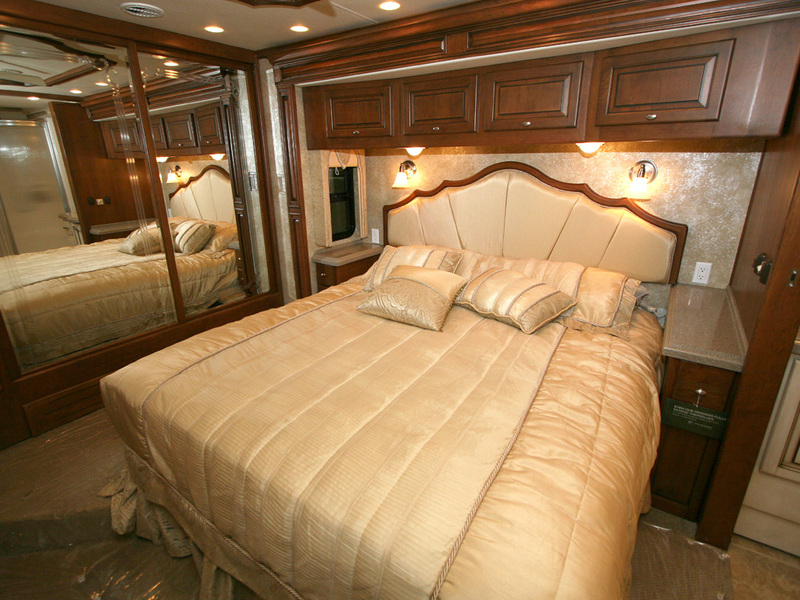 This particular coach features a Select Comfort air mattress king bed. At the opposite end of the bedroom is a 26" LCD TV, clothes hamper, and cabinetry with lots of storage space. The standard ceiling fan is barely visible in this image as is the wooden ceiling trim. At the rear of the coach is a large cedar lined wardrobe close with full length mirrored sliding doors. Additional drawers and a shirt closet flank it to the left. To separate the bedroom from the bath area a pair of sliding doors are used. 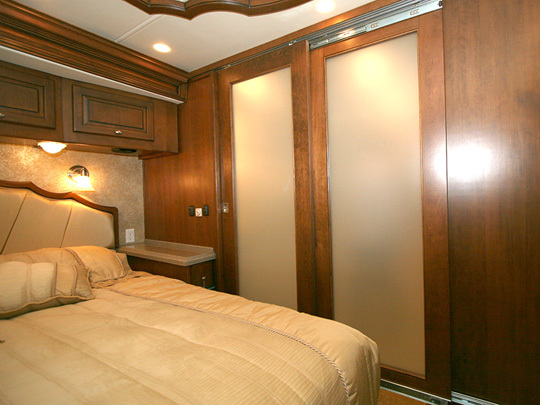 These doors stack on the passenger side of the bedroom and then extend out to create privacy. The doors are filled with a frosted glass that allows light through, yet obstructs vision. This replaces clear glass with pull-down shades used in previous models. The 2009 Allegro 43QRP is a very popular coach. For those RVers looking for a tag axle coach with plenty of room and amenities the Allegro Bus is a perfect fit, offering the most value considering the many features it comes with. 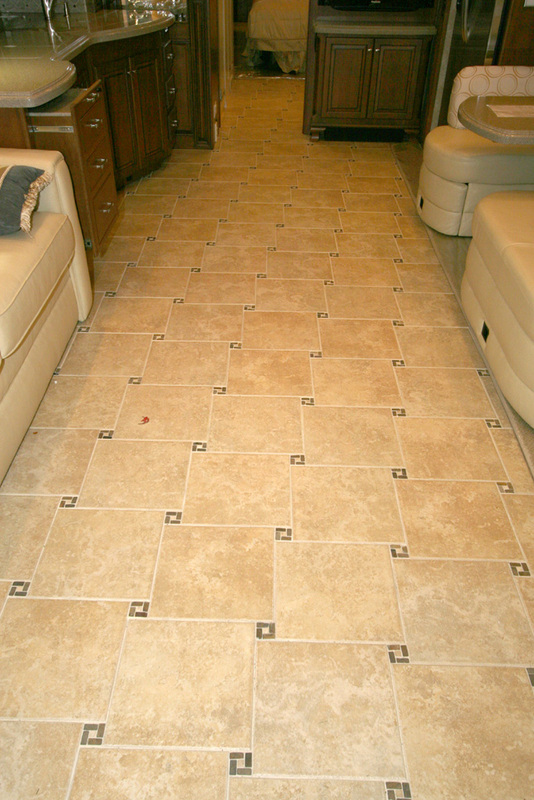 The additional floor space that the 43QRP offers makes for a very attractive floor plan. 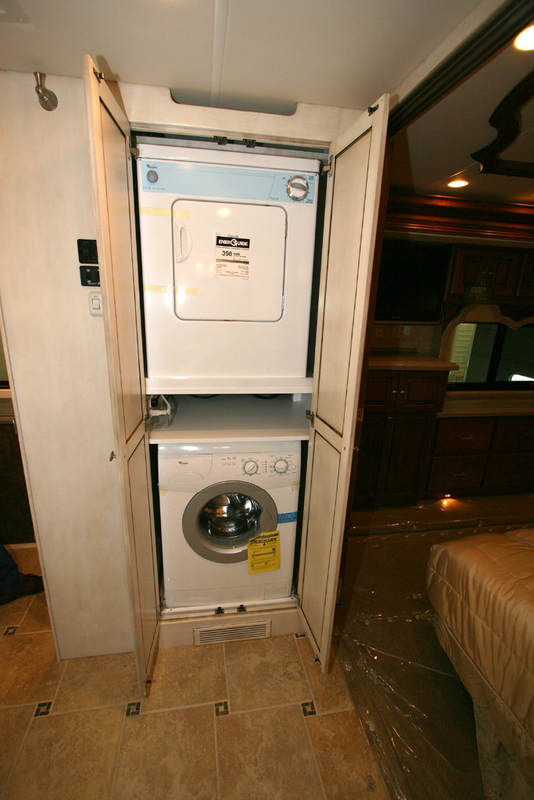 The ability to include a residential refrigerator and stackable washer-drier make it well suited for full-timers as well as part-time RV enthusiasts.